What year is this Motobecane Mirage II, anyone? And do you know what size the headset and the bottom bracket is? Did Mirage II follow Mirage? Or was Super Mirage the successor? Check the BB threading - it's either French or ISO/BSA/British. If an ordinary Japanese adjustable cup threads in easily, it's relatively new and all ISO. If it won't go, BB and HS will be French threading. Can anyone identify what frame we are talking about here? A friend sold it to me and said that it is most likely Italian, but couldn't tell the manufacturer - any ideas? It's a typical mass produced frame from the bike boom era. Early 70's I'd think. Real long reach brakes are needed if you want to use 700c wheels. I had one just like it, same lugs and construction...it had campy Valentino Extra gears and Balilla brakes but I can't remember the marque. Not valuable...it would make a nice fixed gear/singlespeed conversion. Thanks Warren for your input. I remember now...mine was a Winthrop. Realize that these bikes were made to be rebranded so the frame could be identified as one of numerous second tier marques. Look for signs of chrome under the scratches...mine was full chrome under the paint. Looking for more info on Davidson road bikes. 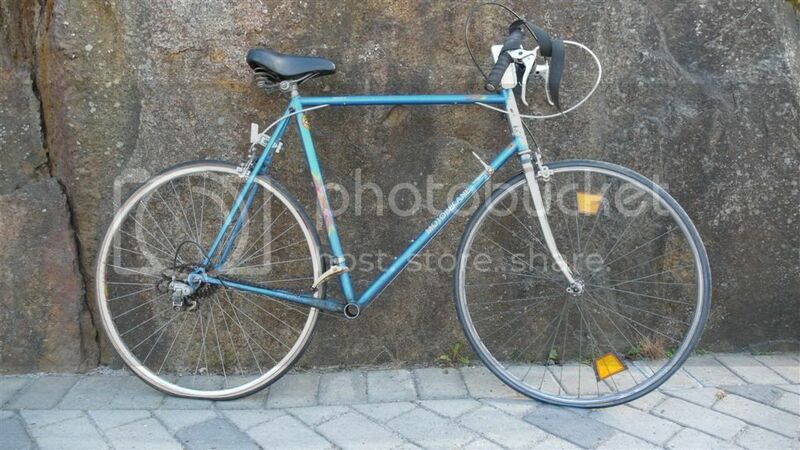 My neighbor offered me her "old" road bike and it turned out to be a Davidson w/Shimano 600 component group. We've been having somewhat of a heat wave here in North Carolina the past few days. I believe it was around 95 degrees yesterday....maybe 98 today....and they say it could possibly reach 100 tomorrow. Well, I hop on a bike and go riding - regardless of the heat. My family thinks I'm crazy. I tell them it doesn't really bother me. I use a hydration pack - and keep myself hydrated. I tell them - I'm making my own breeze - so it's not that bad. Does anyone else enjoy riding in these temperatures? (and I'm serious - I really do enjoy the ride - even if it's over 95 degrees). I was just browsing around on ebay the other day (Haven't bought anything lately - been out of work since Feb. 6 - due to down-sizing) - so I was just browsing - looking at bikes. I saw an old Schwinn Super Sport - probably very early '70's - red. It had 25 bids and sold for $218 plus $87 shipping. I was really surprised at that. I have an one - it's yellow. I took the wheels off and hung them up in the work shop - and the rest of it is hanging in the back of the garage. My plan for it - was to re-build it and sell it (since I have an early '70's Sports Tourer I still haven't re-built - but I plan to keep it for my "collection" ). So, maybe I should fix up the old Super Sport!